I loved this book. I wasn't sure what to expect, but it grows on you. Like you, I didn't realize some of the people would make reappearances later in the book, so I missed the first one or two that returned. I loved the individual voices though. Each person had their own story to tell, and it was like getting many short stories all tied together in one overarching plot. Seeing the movie trailer, I fear what they've done to make it work on the big screen. I think I'm going to have to treat it as something entirely new, otherwise I'll spend the entire movie shouting about what they did wrong, and my husband doesn't appreciate when I do that. Hey, I read that book too! I didn't pay for mine... It was given to me. By somebody that didn't read it. He was all like, "I just found out Max Brooks is Mel Brooks son. 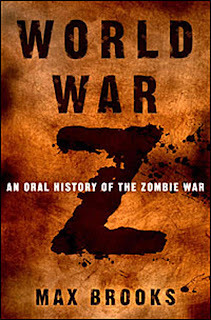 I'm not reading a zombie book by a guy related to the guy who made Robin Hood Men In Tights." I found the book surprisingly intense. Kinda like listening to people tell their stories about the worst times of their lives. I remember watching a documentary in high school where they interviewed people that had survived Sobibor. Every single one of them had this surreal, distant, haunted look in their eyes. That is what I imagined when reading this book. But then, I do like me some zombie stories.